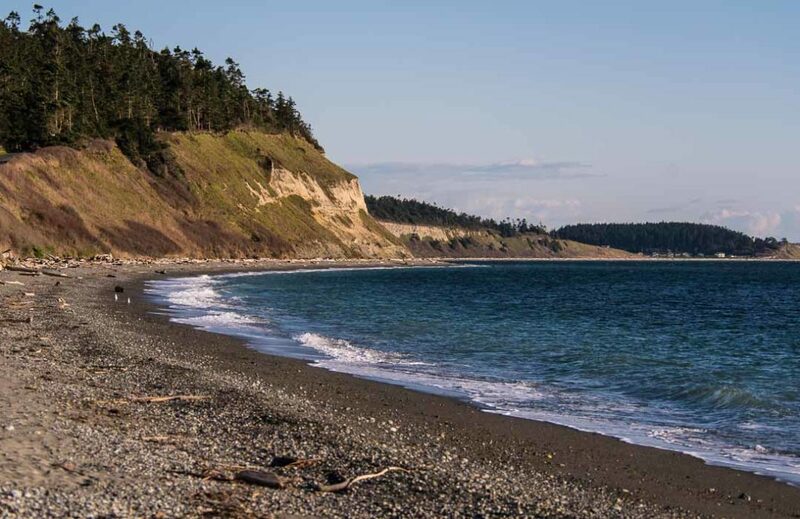 Perhaps Whidbey Island’s most iconic beach, and certainly rich with beauty and history, Ebey’s Landing is Our Best Beach This Month. Here in the Puget Sound, there seems to be a time each winter where spring comes for a visit, teases us for a while with what’s to come—green grass, blue skies, and sun. That’s a time to relish, and maybe, just maybe, venture forth from one’s winter cave, and explore. It’s that spirit of exploration that brings us to our favorite beach in the spring—Ebey’s Landing. Driving to this beach is a visual surprise. From one direction, it’s a hairpin turn in the road and you’re there. The entire beach and marine view from bluff to bluff hits you full on. From the other direction, a sharp right and you realize you’re on top of a bluff, now driving parallel to the water’s edge; a slow dramatic descent to the beach. Take state route 20 north from Coupeville to Ebey road. Follow it as it angles to the right and becomes Ebey’s Landing Road. Drive carefully around the hairpin turn and you’re there. I get out of the car—the afternoon sun in full springtime bloom. By parking, I’m essentially already on the beach. I only have to take a few steps past the driftwood and I’m there. The wind off the water smells clean. It’s easy to think that maybe winter is over. 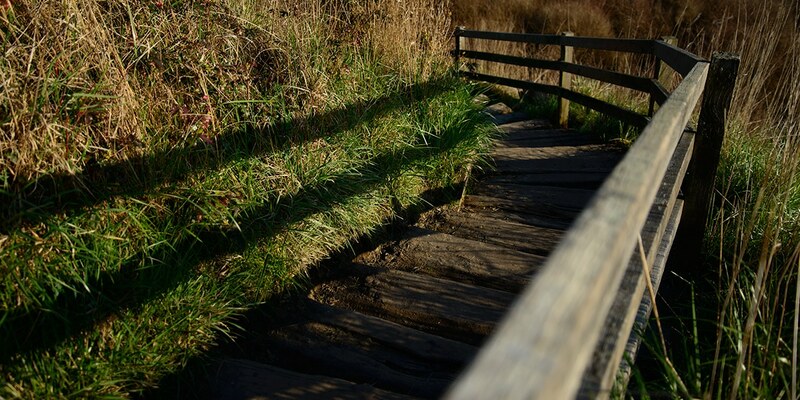 These weathered, but solid stairs are the link between the bluff trail at Ebey’s landing and the beach. This place is an icon, its long narrow curve bounded by bluffs at either end. Inland, there’s a prairie; some of the richest farmland anywhere. It’s a place of magazine covers, books, posters, and the signs that mark Whidbey Scenic Isle Way. Unlike the coast, the sheltered waters here of Admiralty Inlet usually produce small waves, a gentle echo of the usual ocean roar. In the distance, beyond the eastern bluff, I can see Camp Casey and Admiralty Head Lighthouse. The ferry has left, small and distant, gleaming its distinctive green. 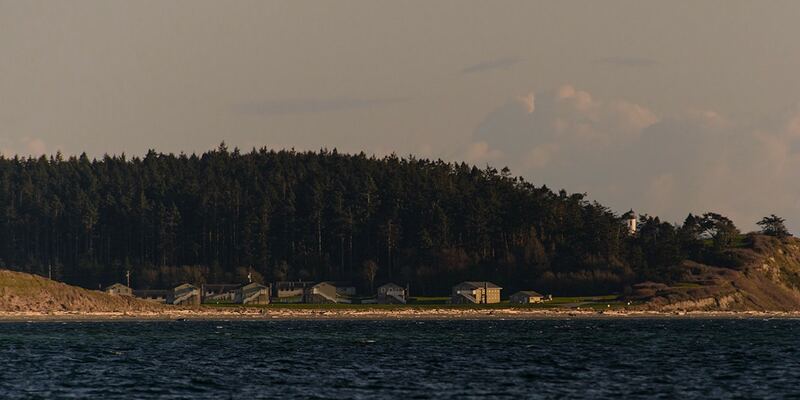 From Ebey’s Landing, it takes a sharp eye to spot Camp Casey and Admiralty Head Lighthouse in the distance. The gentle afternoon, however, masks the long history of exploration and adventure that makes this beach important. An informational sign explains Native Americans used the beach long before European settlers and that, “Over the years it’s been a gateway for communication, travel, and trade.” One can stop and read about Jacob Ebey, for whom the beach is named, and learn of his tragic death as a revenge killing by Native Americans. But, the sun calls, and for the moment, the wind has chosen to hold its breath. A couple walks their dog. In the distance a hiker has ascended some rough-hewn stairs that invite you on a long hike to the bluff at the west end of the beach. Just beyond those stairs is a panorama of the prairie, the land Jacob Ebey once owned and farmed. To the right is his house, and on a bluff to the left is Sunnyside Cemetery, where Ebey and many early settlers are buried. The top of the bluff is calling, and I see a couple halfway up, enjoying the view. I’ve seen it recently. I know there’s an easier trail to get to that spot, and I think my exploration for today is over. No, my exploration really didn’t go very far today, but I’ve had my breath of fresh air and my moment of sun. Spring will soon come, and so will summer and the beach walk; and a bluff trail can just wait for another day. 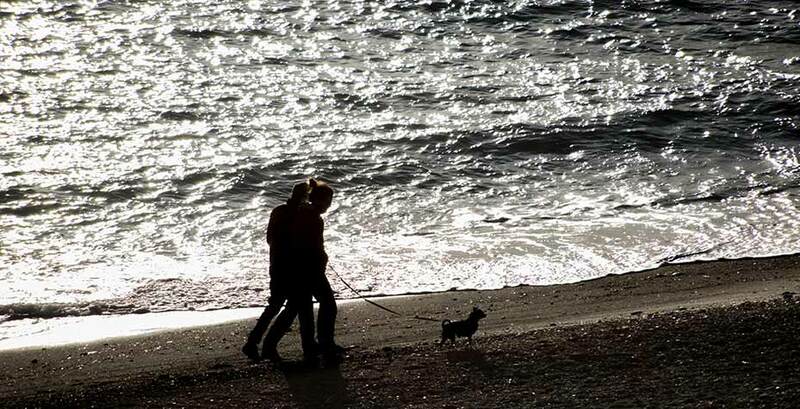 A couple and their dog walk along the beach at Ebey’s Landing.